Cotton canvas handprinted with organic pigments. Raincote finish. Constructed with double layered web handles, reinforced stitching throughout with a sturdy bottom insert. Snap closure guards against spills. Approximate size is 12" x 14" x 5-1/2"
Canvas tote coated with RAINCOTE™, a polymer coating . Double layer handles, sturdy bottom insert, reinforced stitching and snap closure. 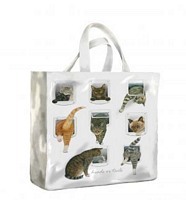 Price quoted is for 1 Tabby Cat Oil Cloth Tote. Price quoted is for 1 Black and White Cat Oil Cloth Tote. 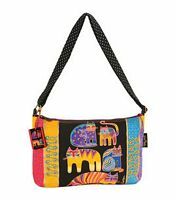 Laurel Burch Indigo Cats Scoop Tote. Between the blue of the day and the black of the night, lies the calming color of indigo. Add the perfect touch of whimsy to your accessory collection or to any luggage set. Artist Laurel Burch has a rare mastery for capturing the magical essence of cats. This Scoop Tote is made of Cotton canvas cloth with a zippered top. 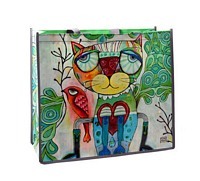 It makes a fantastic gift for the cat lover or anyone who appreciates the whimsical artwork of Laurel Burch. This beautiful bag measures approximately 17 inches x 7 inches x 11 inches. Embellished with hand painted wood bead, sheer ribbon and sequin flowers. The colour of the bag is deep blues, aqua and purples. Each of the cats are outlined in gold, so they really draw your attention to them. There are also a number of gold outlined butterflies on the bag. The Indigo Cats Scoop Bag has a reinforced flat bottom for added strength and padded fabric handles for comfort. The bag is made from a canvas fabric and has a water resistant coating inside the bag. Accidental spills will not damage the bag. The pattern is the same on the front of the bag as it is on the back of the bag. However the ribbon and sequins only decorate the front of the bag. These bags are not washable, but you can spot clean them. 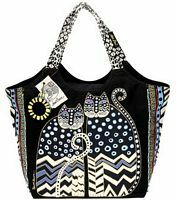 Laurel Burch Autumn Felines Oversized Tote. This colourful bag will acquire many admiring glances. It features hand printed fabric in blue, grey and a multitude of other colours. This 20-1/2 x 14 x 6 inch bag also features two small outside pockets; a zipper top; and three inside pockets. The double handles each measure 25 inches. Each cat is thinly outlined in gold. The bag is made from a canvas fabric and has a water resistant coating inside the bag. The Autumn Felines Oversized Tote has a reinforced flat bottom for added strength. The three felines feature on the front of the bag. The back of the bag does not feature the cats. There are lines and patterns and squiggles all over the back of the bag. Large tote, weekender bag or carry supplies. Recessed zipper is 2" from lowest inside edge. Printed canvas with same polka dot cat motif on front & back of bag. Front accented with gold metallic & black ribbon. The ribbon is lined with a row on each side of small wooden accent beads. Hand-painted wooden circle charm & white canvas signature label dangles from 1.25" dual straps. When on shoulder, hangs close to the body comfortably very snuggly under the arm. If full will be heavy. Inside pocket pouch (7.5" wide x 8" high) with zipper pocket, open pocket & cell phone holder with Velcro latch, and ribbon label with cat face. Black rigid bottom sewn into the bag. Bright, vivid colors define the signature artwork of artist Laurel Burch. Her totes are designed to be practical and useful art. 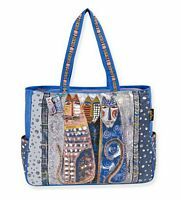 The brilliant hues and wonderful patterns of her carefully designed totes appeal to everyone. Designed to be artful and useful at the same time, use your tote to carry. Price quoted is for 1 Polka Dot Gatos Scoop Bag. Size is large enough for an overnight bag. Approximate size is 21" x 6.5" x 15"
Recessed zipper top closure with cat design zipper pull for additional protection. Piping trimmed reinforced flat rigid bottom. Inside pocket pouch (8" x 8") with pocket and cell phone pocket. This colorful bag will have everyone stopping to look closer. It features hand printed fabric and embellishments that add extra texture. This 15 x 10 x 1 inch bag also features a zipper top and one inside pocket. The single adjustable strap measures 52 inches. Rosina Wachtmeister is famous for her warm, shining colours and love of animals, especially cats drawing. Ulster Weavers transfer Rosina’s distinctive artwork onto this shopping bag. Pure cotton with a PVC coating, it is easy to wipe clean with a damp cloth. Strong and durable. Measures 31cm W x 39cm H x 15cm D with 30cm L straps, generous space. Magnetic clasp to keep the bag closed, cotton lined with inner zip compartment.